Join JVC to Live With Purpose by creating sandwiches and meals this month to support individuals experiencing hunger or homelessness. Who are we helping? Meals will be donated to Weinberg Housing Resource Center. Make sandwiches- place each sandwich into a Ziploc bag. Set up assembly line of items that go into lunch bags. Fill the bags with the various items. Store the bags in the refrigerator or deliver them as soon as possible. Learn more about the issue of homelessness and hunger and use discussion questions with your family/group! Stay tuned! Materials coming soon! Since sandwiches are perishable, please contact JVC before doing this project to arrange drop off or delivery. 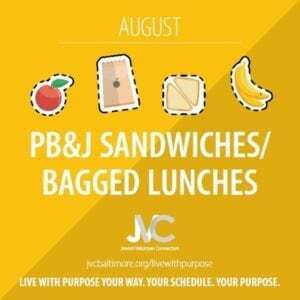 $18 for peanut butter and jelly, paper lunch bags, and markers/stickers to decorate 10 bags.